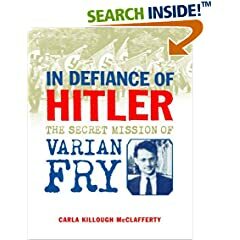 One of the hot non-fiction books of the year is In Defiance of Hitler: The Secret Mission of Varian Fry. This is the story of a Harvard educated American, Varian Fry, who went to Nazi-controlled France and helped Jews escape, including many renowned artists, writers, etc., such as Marc Chagall, Max Ernst, and Heinrich Mann. He was an American Oscar Schindler. Written by my friend, Carla Killough McClafferty, it’s already received a starred review from Kirkus and is bound to receive more attention. The Jewish Books for Children with Author Barbara Bietz blog has an interview with a behind-the-scenes glimpse of the research involved in recreating this story for readers.